Prepare the sprouts, removing the outer leaves. Trim the base, and cut a cross in the bottom of each, if you wish. Cook in boiling salted water for 5-6 minutes until just cooked – don’t overcook! Drain, then stir-fry with some lardons of bacon until the bacon is crisp. Season with salt and pepper and serve. 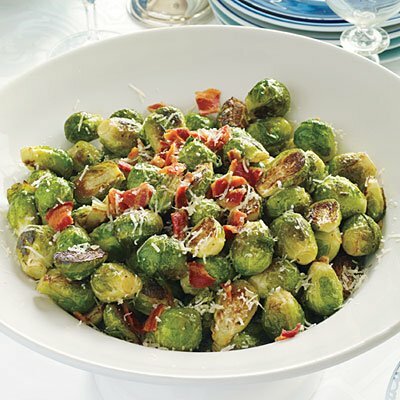 Variations: Toss the boiled sprouts in butter with chopped herbs such as chives and parsley; serve boiled sprouts with toasted almonds or chopped chestnuts; or serve boiled sprouts with a little grated orange zest.